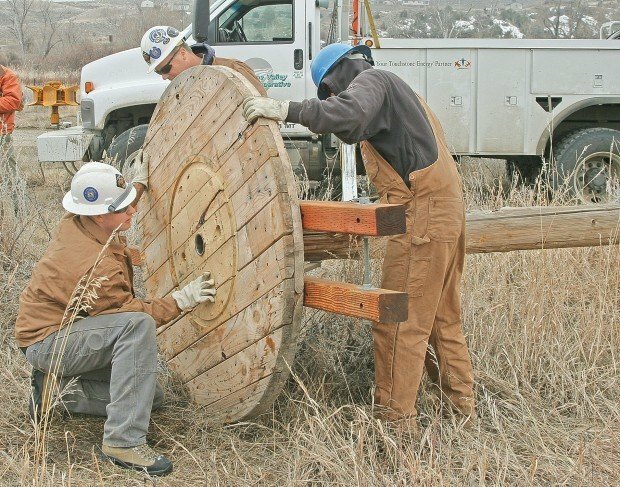 Yellowstone Valley Electric Cooperative linemen, from left to right, Cody Inabnit, Jared Haworth and Mike Teeter attach the platform for a new osprey nest at Duck Creek Fishing Access on Tuesday. Yellowstone Valley Electric Cooperative linemen raise a platform for a new osprey nest at Duck Creek Fishing Access on Tuesday. The birds have been building their nests on power poles nearby. The hope is that they will build on this new site. Robert Lubbers, left, and Monty Sullins attach branches from last year’s nest platform for a new osprey nest at Duck Creek Fishing Access on Tuesday. A prime piece of real estate opened up this week along the Yellowstone River — for osprey. The 60-foot pole at the Duck Creek Bridge Fishing Access Site has a sturdy round platform. The view is great. It’s off the road. There are even a few “starter’’ twigs secured on top to encourage nesting by the fish-eating raptors. Best of all, there is no 7,200-volt power line running through it. 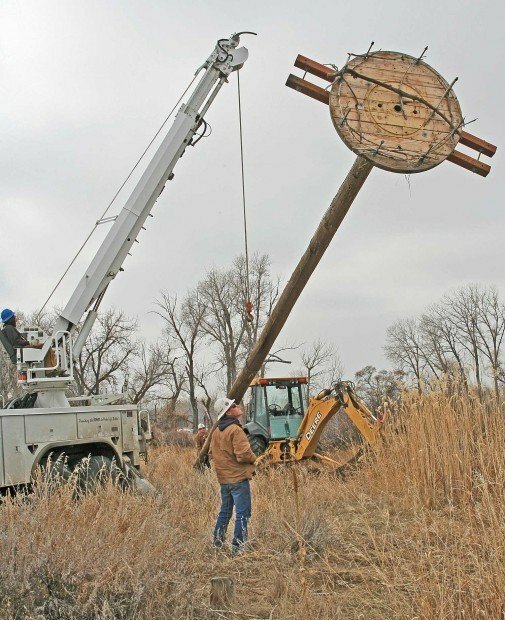 Yellowstone Valley Electric Cooperative, with support from federal and state agencies and the Yellowstone Valley Audubon Society, erected the nesting platform after removing a large nest from one of its power poles nearby. Last year, osprey raised two young at the old nest, which was located atop YVEC’s power pole next to the bridge. The power company had removed the nest before, with oversight from regulators, but osprey kept returning and rebuilding. The nest was among 30 osprey nests from Big Timber to Billings that were identified by the Audubon Society in a survey conducted last fall. Monty Sullins, an Audubon member, said the local chapter has begun a conservation project to survey and monitor osprey nests in Yellowstone country. The chapter hopes that information gathered will help with overall osprey management and conservation in the Yellowstone River corridor. Audubon wants to work with power companies, landowners and government agencies to reduce hazards for the birds and to help relocate problem nests, Sullins said. Osprey have made a comeback from the 1970s, when numbers dwindled because of the insecticide DDT, which was banned in 1972. Osprey are not considered endangered or threatened but are protected under the federal Migratory Bird Treaty Act. While typically more numerous in Western Montana, osprey have been moving east for at least the past 10 years. The birds are not too picky about nesting sites. In addition to tree snags, they inhabit power poles along roadways and have tried to build nests on top of smokestacks at the ExxonMobil Refinery in Lockwood. But they are persistent. Osprey migrate south for the winter and often return to the same nest year after year in the spring to raise young. “Osprey can be rather problematic,” Holzer said. The branches, twine and other materials that osprey use in feathering their nests on power poles can conduct electricity. Birds can get electrocuted, he said. There are problems with power outages and risks of fire, he said. YVEC has three or four osprey nests to contend with, including a large nest on a distribution line south of Laurel, he said. The co-op insulated the energized conductors with rubber covers and that worked for a few years, Holzer said. The co-op finally conceded the pole to the osprey and moved the lines. YVEC worked with state and federal wildlife agencies to remove the Duck Creek Bridge nest and to erect a new platform, Holzer said. The 4-foot-diameter platform is the end of wire spool that has been attached to the pole. Long bolts extend through the platform to help secure nesting material. To deter osprey from rebuilding at the old site, YVEC installed triangular-shaped devices on the power pole’s cross arms. YVEC put in the $1,200 to $1,500 in labor and equipment costs for the platform, Holzer said. Audubon, Sullins said, wants to help with the expense and has set up a special fund for the osprey project. Any money donated to the fund will go toward helping to relocate nests and erecting new platforms. “At $1,000 or more a pop, there’s going to be money involved,” he said. People may send donations to the Yellowstone Valley Audubon Society, Attention: Osprey Fund, P.O. Box 1075, Billings MT 59103-1075. Whether osprey will move into the new Duck Creek Bridge platform remains to be seen. The birds are expected to start showing up in a week or so. “Hopefully, this will be a go for them,’’ Sullins said. Osprey in Yellowstone County will be the featured topic at the Yellowstone Valley Audubon Society’s meeting Monday night. Chapter member Monty Sullins, who leads the organization’s osprey conservation project, will give an update on efforts to survey and monitor the raptor along the Yellowstone River corridor from Big Timber to Billings. The meeting will begin at 7 p.m. at Mayflower Congregational Church, on the corner of Rehberg Lane and Poly Drive. The meeting is open to the public. Guest speakers will include Sam Milodragovich of NorthWestern Energy, who has led the power company’s efforts to relocate nests from power poles, and Amanda Ormesher, a University of Montana student in wildlife biology. Ormesher has been researching the hazards of baling twine used by osprey in nest building. The birds pick up the twine in fields but can get tangled in the material. Officials from electric cooperatives and the state Department of Fish, Wildlife and Parks also have been invited, Sullins said.